Cross these lines only to make a left turn into or from an alley, private road, or driveway. Cross these lines to pass other vehicles, but only if there is no oncoming traffic. Cross these lines under no circumstances. Cross these lines only to make a U-turn. 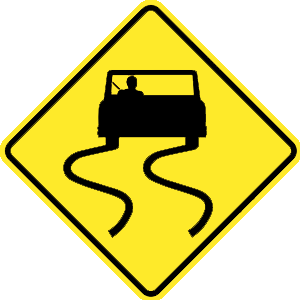 Double solid yellow lines are used to mark roadways where passing is prohibited from both directions. You may cross these lines only to make a left turn into or from an alley, private road, or driveway. The faster you drive, the greater the impact or striking power of your vehicle. When you double the speed of a car, you increase its force of impact by four times. Pulling into or out of a parking space. Pulling into traffic from a parking area or alley. Your turn signals should always be used when you make any movement to the left or right. You should use your signal when pulling into traffic from a curbside parking space, moving into a new lane, or passing another vehicle. Octagonal signs are always stop signs. Come to a complete stop when approaching a red, eight-sided sign.